Welcome to Applause Dressage Freestyle Design! Whether you are an international Grand Prix rider, Paralympian, Young Rider or First Level amateur rider, Applause Dressage can take you into the wonderful world of riding to music. An extensive and varied music library, choreography designed by someone who knows the sport from the saddle, and finely tailored editing, are the main ingredients I put into every project. With over ten years’ experience, I continue to bring enthusiasm and creativity to every freestyle I design, whether the goal is the Olympics or a first freestyle experience at a local show. Applause Dressage clients have included Olympians, World Cup and WEG finalists such as Bernadette Pujals, Ashley Holzer, Leslie Reid and Leslie Morse; NAJYRC Champions like Alex Duncan and Jade Deter; and countless others of all ages from eight to seventy-eight, whose greatest horse show thrill has been enjoying the harmony and fun of riding their horses to music in front of an appreciative audience. If you want to dance with your horse, you are in the right place. 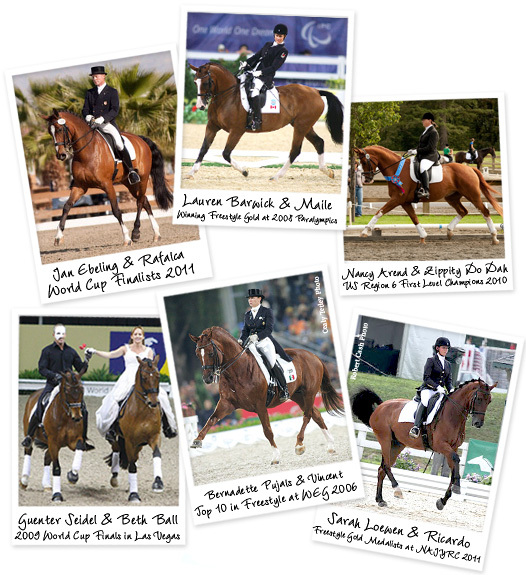 For more Applause Dressage News, click here.